The Moultrie Hanging Feeder enables you to distribute feed to deer with the programmable, down-to-the-minute digital timer that allows you to determine the precise time to distribute feed, as well as the amount (1-20 seconds). After owning this machine for a while, you'll just about be able to set your watch to the pattern of deer activity surrounding your feeder. Timed feedings can be scheduled up to 6 times a day, and prevent wasteful free-for-all buffet activity that can attract anything and everything. 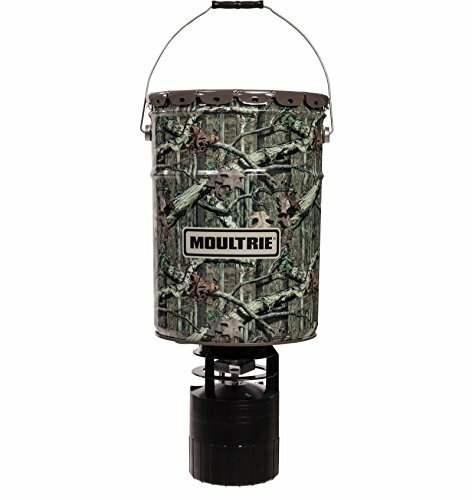 This Moultrie Hanging Feeder features a built-in varmint guard, and metal spin plate and funnel. The feeder distributes pelletized food, shelled corn, and soybeans in a 30-ft diameter circle at 360 degrees. The ABS plastic kit housing can be removed easily from outside the barrel without having to empty the feeder. Works with one 6V battery (not included).